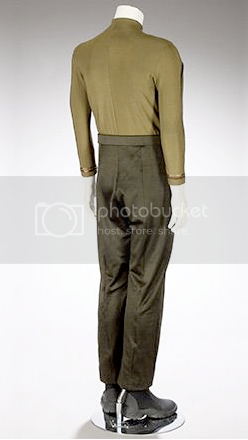 Male USS Kelvin costume jumpsuit with dark brown pants, attached light brown shirt and black boots. 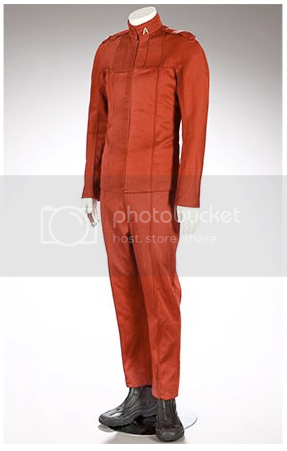 Created by Michael Kaplan for "Star Trek" (Paramount Pictures, 2009) Jumpsuit size medium, Shoes unsized. 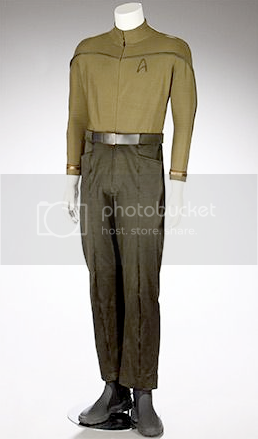 Male Nareda Romulan crew member costume, studio tag indicates that this was worn by Richard Arnold who played a Romanulan science tech on Nero's mining ship The Narada. Created by Michael Kaplan for "Star Trek" (Paramount Pictures, 2009). Costume and shoes unsized. 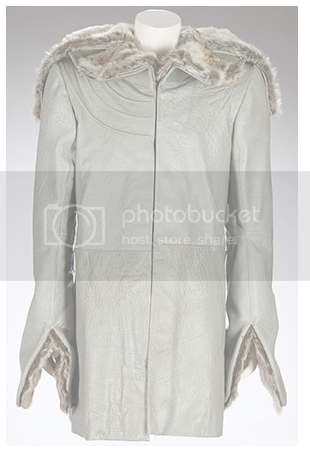 Ambassador Spock's gray leather parka and gloves as he is marooned on Delta Vega by Captain Nero in "Star Trek" (Paramount Pictures, 2009) and worn by Leonard Nimoy. 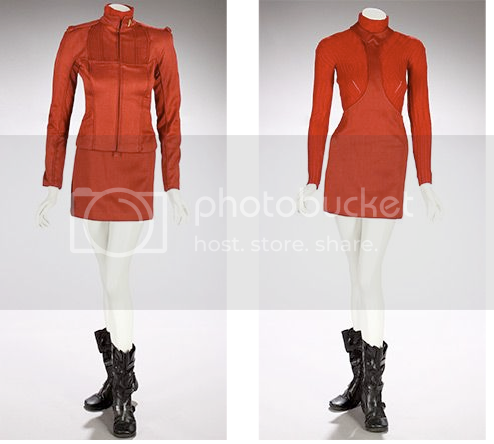 Female Star Fleet Academy cadet costume of red knit mini dress and black boot created by Michael Kaplan for "Star Trek" (Paramount Pictures, 2009). 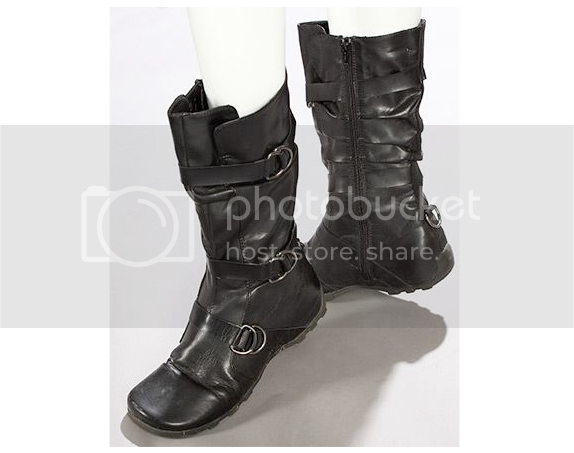 Dress extra small, Boots 8 1/2. 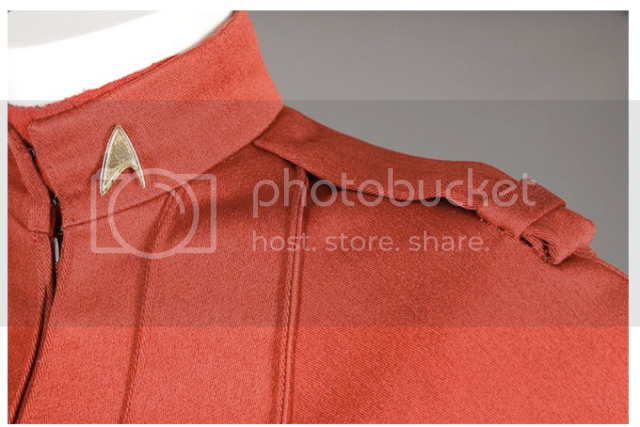 Male Star Fleet Academy red cadet suit, with Star Fleet insignia at collar created by Michael Kaplan for "Star Trek" (Paramount Pictures, 2009). Suit size medium, Boots size 10. 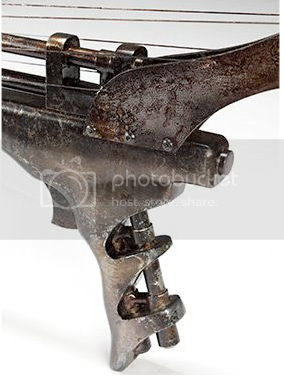 Klingon prop Disruptor Rifle created for "Star Trek" (Paramount Pictures, 2009). 10 inches by 36 1/4 inches. 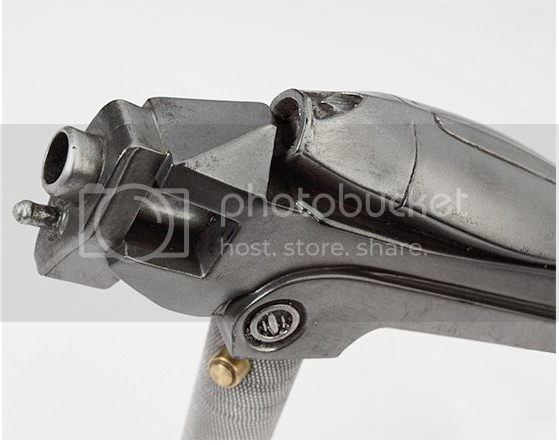 Here are the photos as posted by Julien's of the Star Trek movie props that will be auctioned off. The props were from Bad Robot and are being auctioned off by JJ Abrams wife for her charity. I believe these are the props that were shown in the Arclight Theater, that I reported on previously, and which i inspected in the Bad Robot offices. I think there are going to be some very high prices realized, and I will write on my thoughts about that soon. In the mean time, enjoy the photos! 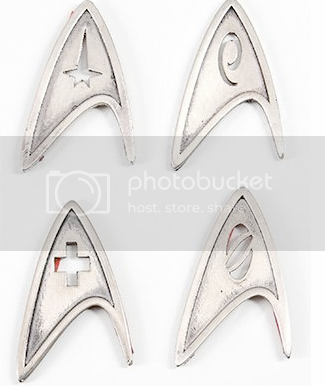 Four silver tone plastic Star fleet insignia badges created for "Star Trek" (Paramount Pictures, 2009) these types of badges are seen on crew members throughout the film. 2 by 1 1/4 inches. 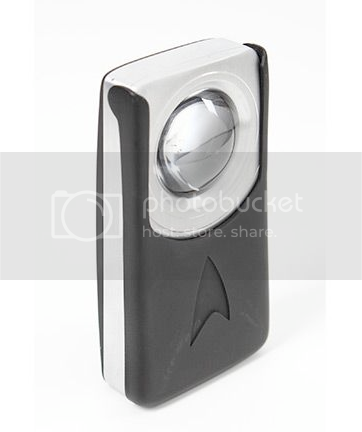 Star Trek Movie props to be sold by Julien's at Planet Hollywood! 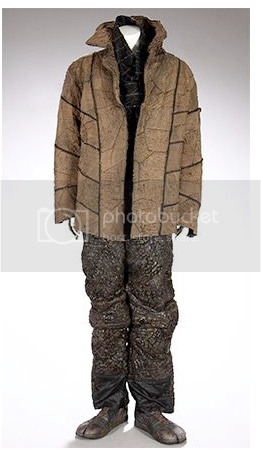 In the summer of 2010 at Planet Hollywood Resort and Casino in Las Vegas, Nevada you can own a piece of movie history as props and costumes from the Paramount Pictures Motion Picture Star Trek (released May 8, 2009) hit the auction block with Julien’s Auctions. The J.J. Abrams directed blockbuster exploded onto the screen to rave reviews and box office success and next summer you can bring home a piece of the adventure. 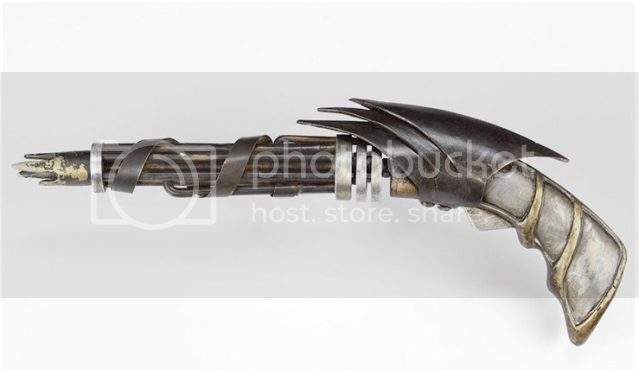 The Julien’s Auctions Summer Sale of entertainment memorabilia, planned for early Summer 2010, will contain 25 props, costumes and set pieces from Star Trek. These items are being auctioned to benefit Children’s Defense Fund (childrensdefense.org) and Student Veterans of America (studentveterans.org). 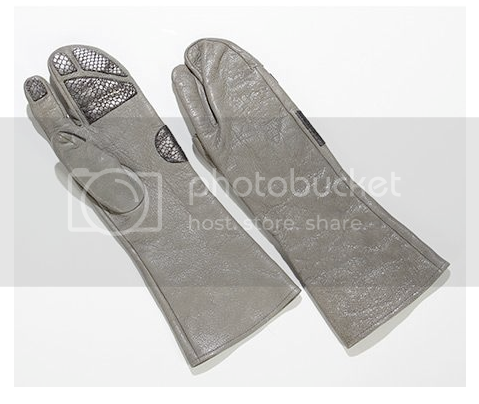 True Star Trek Fans can also own the equipment needed to survive in the final frontier. Seat yourself aboard the bridge of the U.S.S. Kelvin in uniform with your Hero Chair and try to avert future and past disasters. Outfit yourself for a fight in a rugged Romulan costume armed with the prop weaponry from Nero's mining ship The Narada. 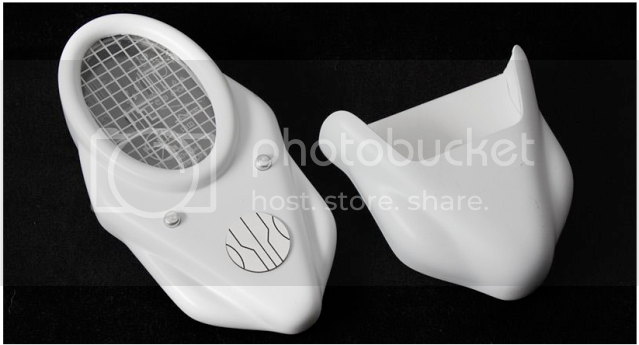 Whether it’s a physician’s Tricoder or your own phaser, these props will make you feel like you’re a part of the action. 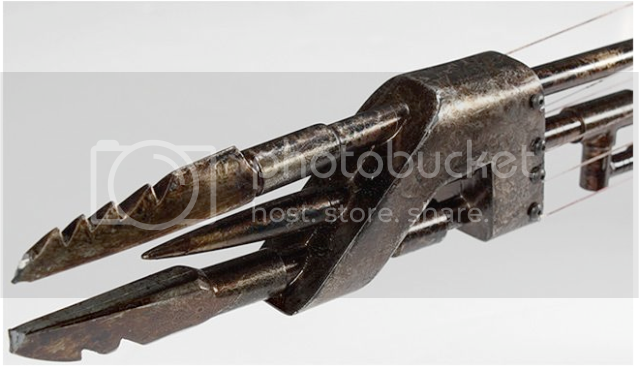 As a very special addition to the auction, eight one-of-a-kind artist rendered U.S.S. 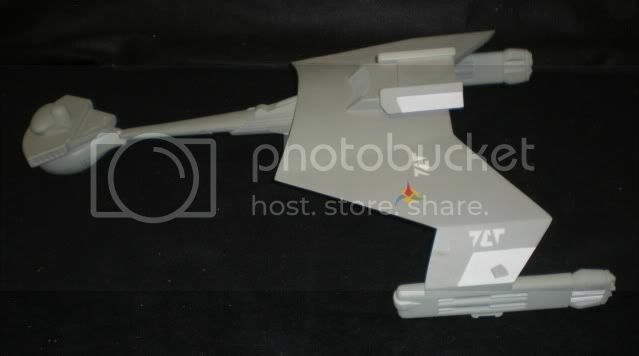 Enterprise models will also be available. Built by Quantum Mechanix and painted by artists from around the world, these custom-made collector dream items will also be sold to benefit these remarkable charities. ABOUT THE FILM: The greatest adventure of all time begins with “Star Trek,” the incredible story of a young crew's maiden voyage onboard the most advanced starship ever created: the U.S.S. Enterprise. On a journey filled with action, comedy and cosmic peril, the new recruits must find a way to stop an evil being whose mission of vengeance threatens all of mankind. For more photos an dinfo, go to the Julien's Web Site. While the Battlestar Galactica auctions have dominated my working life the past year (and cut down on my Star Trek activity), my passion for Star Trek has not diminished. And so, last year I started working on making the sale of the Doug Drexler collection into a full blown auction. Propworx, my company, is now working on 5 new auctions for 2010, Iron man being the first, which will be April 17-18 at the Chicago Comic Con. 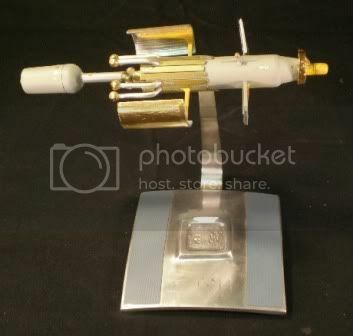 But right after that will be the Propworx Star Trek auction in May. We haven't set a date yet, but we are working on it now. The auction will be held at the Pasadena Convention Center in Los Angeles. We are also hoping to get CBS involved, and more on that will follow. This auction will consist of the Doug Drexler collection, the Rick Sternbach collection and items from other behind the scenes Star Trek luminaries. So far we have about 300 lots, including some amazing pieces of Star Trek history, dating back to TOS. Most amazing of all is the Star Trek Kirk filming miniature from The Motion Picture. And if you liked our Battlestar Galactica catalogs, then what we have planned for the Star Trek catalog will blow you away. The catalog will be a true collector's item, and be a signed, limited edition. It will include interviews with Star Trek creators and be a real work of art. We will also be having a "Behind the Scenes at Star Trek" event the day before the auction, with panel discussions from the people who created the art, props, models and costumes for Star Trek, so you really will want to come out to this event. 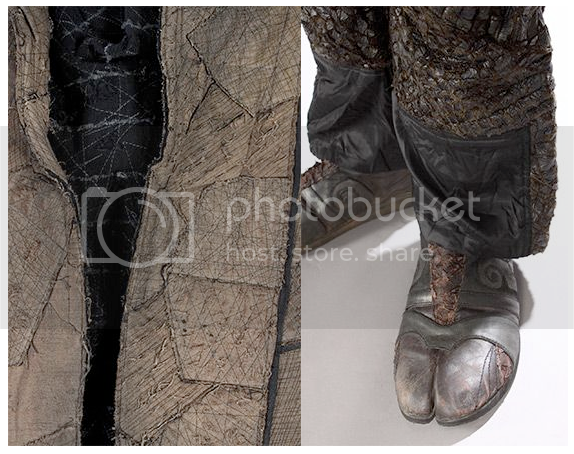 Plus there will be a get together for Star Trek Prop, Costume & Auction Forum members. 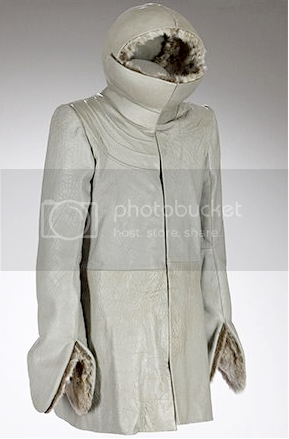 Also, if you have any Star Trek items you would like to consign, we are taking consignments now. Contact me at alec@propworx.com. We have a few more surprises up our sleeve that we will let you know about over the coming months. 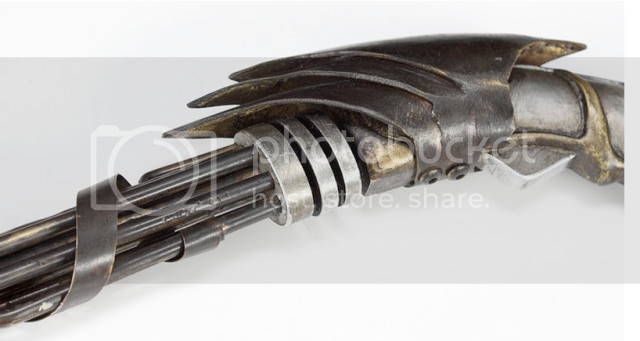 After returning the Assault Phaser I bought when we found out it wasn’t a production made piece, the seller, a member of the Star Trek Prop, Costume & Auction Forum, offered me a screen used Klingon Communicator instead. Now, the seller didn’t purposely try to deceive me on the Assault Phaser. She just fell into the trap of believing the story she was told about its origins. 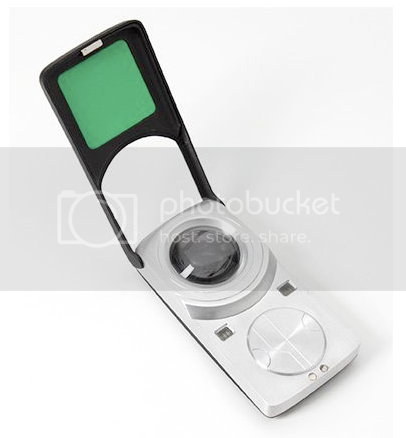 She also had many other real Star Trek props and costumes, and I had bought from her before, so I jumped at the chance to buy the communicator. 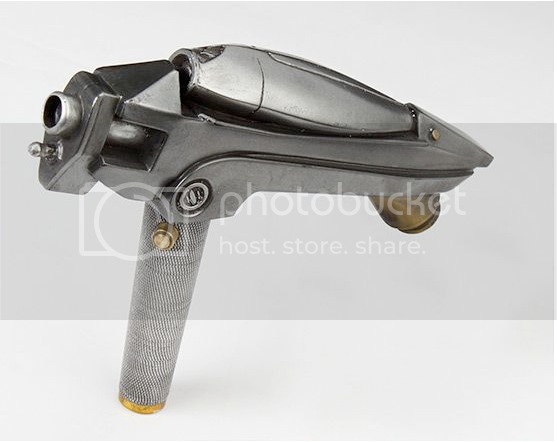 The comm was a Klingon Star Trek II/IV type as seen on-screen used by commander Kruge and Kirk in Star Trek III and by Kirk and Chekov in Star Trek IV. When the comm arrived I was impressed. It was in excellent shape, the lights worked and there was a slide switch on the right front that moved. Now the task to authenticate the item. There are two great parts of this hobby that make my life richer. The first is the friends I have made and the community we have built on the Star Trek Prop, Costume & Auction forum who I get to share this hobby with. The second is the times I have spent authenticating props with my good friend Brett Jones. As many of you know, Brett is the entrepreneur behind Federation Surplus, and he makes the best Star Trek prop replicas on the market. He works now for Hollywood’s top prop shop because he is so good. And because of his years of experience working with Star Trek props, and his meticulous nature, he is an expert at authenticating Star Trek props. He knows paint codes, manufacturing processes and many collectors I know, including myself, give our props to Brett when they need repairs, so he has handled more original Star Trek props than most people I know. When he and I start on authenticating an item, it is a blast, because it is like detective work. 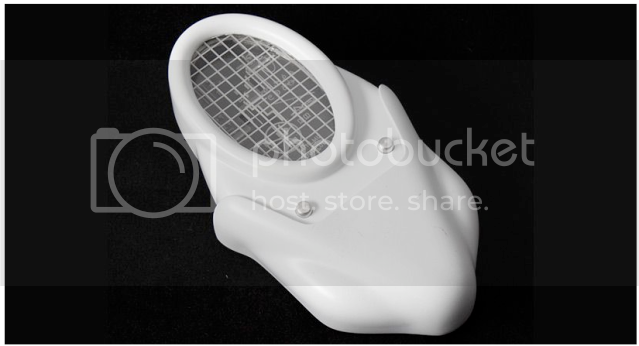 There are screen caps to be seen and people, like the prop makers we have to talk to in order to get the story. So when I got the comm. and sent photos to Brett he and I spent time comparing the comm. to the Blu Ray of Star Trek III and IV. It was clearly not the one from Star Trek III. While you could pretty much only see the back of the comm in Star Trek III, and it was clear this wasn’t that one. And it was hard to tell if it was the one from Star Trek IV, because you always see the communicator from the back when someone is holding it in their hand. It looked like it, but again, nothing definitive. So Brett contacted Richard Coyle, who worked on the early Star Trek movies. 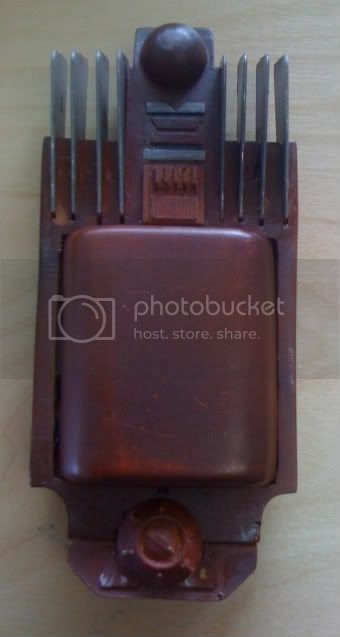 Richard sent Brett the below photograph of the communicator and identified it as the one he sent to the set of Star Trek IV. He took this photo before he sent the communicator off to the set. 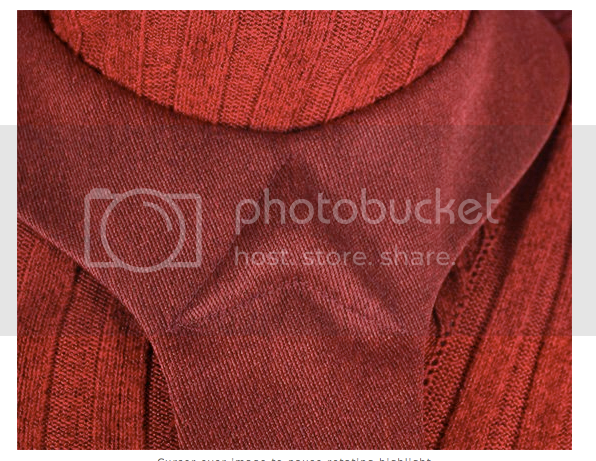 Mine matched this one exactly. 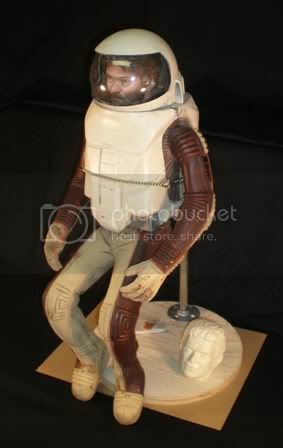 What happened was that when Star Trek IV started the propmaster sent Richard the ST III communicator and asked him to make another hero and a dummy. 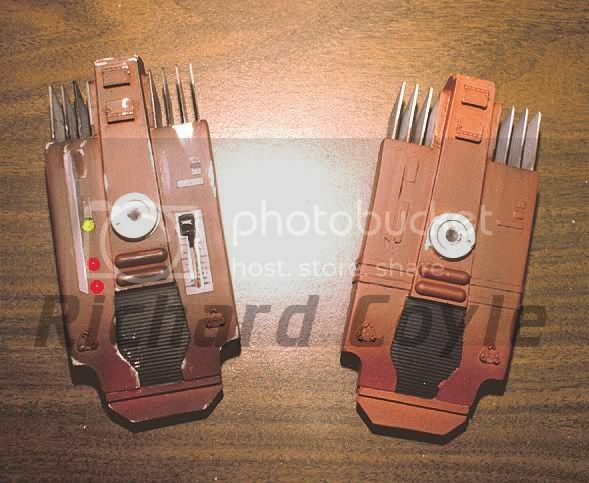 So Richard recast the whole communicator without the blades, making a metal buck for metal blades to be inserted after the resin casting of the body. There are two pieces on mine, of different color, appeared to have been added on the set, something that happened often when props went to set and needed something extra. You can tell these parts are add-ons by the color. 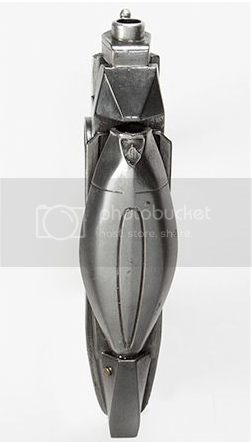 Coyle then recast this piece to make a master for his replicas that he used to sell. 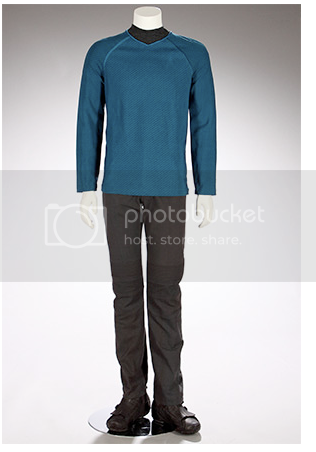 The one on the right in the photo is one of these replicas. Richard also made changes to the ones he sold so they are recognizably different and can’t be mistaken for a production made piece. 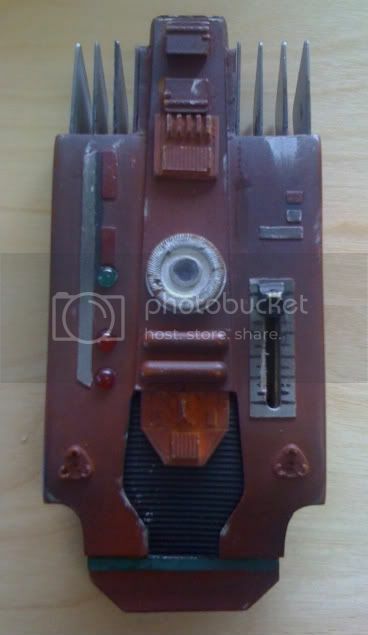 So, with a little work the communicator’s authenticity was resolved and it now resides in my collection. Thanks to Brett and Richard for their help! 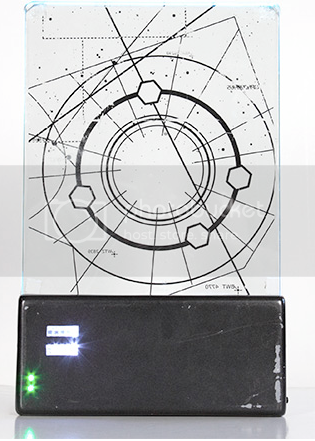 A seller on eBay is claiming that the Vulcan Lyra she is selling is a set used one from TOS. Unfortunately, this is not real, but a reproduction. 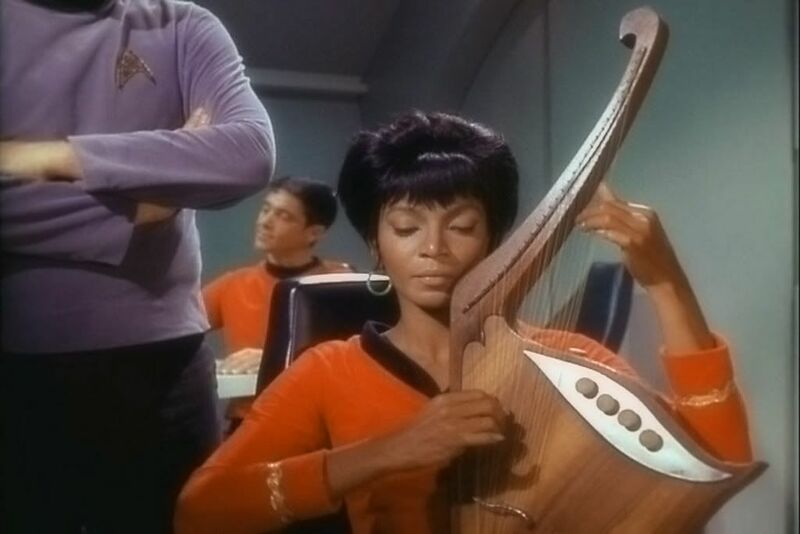 "This is an actual set prop: Spock's Vulcan Harp from Star Trek the Original Series. Only three have ever been made. Christie's auctioned one of these about 15 years ago, I have this one, and I have no idea where the other one is. I don't know if this was ever used in an episode; the broker who sold it to me just said it was on the set. I actually contacted Christie's to auction it, but they told me it wasn't something they dealt with anymore, so they suggested I auction it locally. 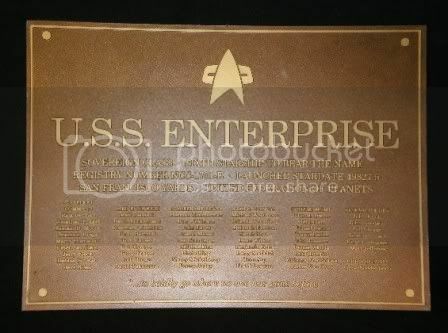 And since no one where I live really cares about Star Trek, here I am auctioning it on ebay...LOL I bought this years ago from a private broker in Long Island New York. It comes with a wooden stand that matches the wood on the harp. The only thing wrong with this is that it's actually supposed to play when you push the buttons on top of the harp, but the circuitry inside of it doesn't work anymore, presumably just because of age. It's been stored for years in a protective case; it's just that it's old. 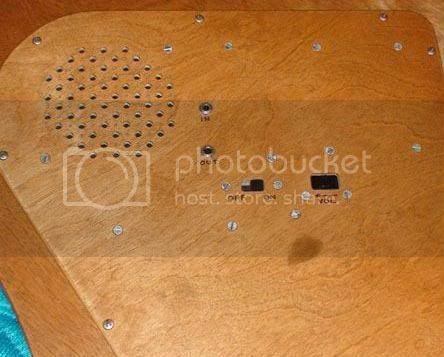 One of the pics has a closeup of the back of the harp where you can see the switch that is supposed to turn the harp on." "This ebay item appears to be made to some blueprints published at some point, http://cygnus-x1.net/links/lcars/vulcan-ha...ction-plans.php. Note the screws at either end of the guard plate under the knobs. Note the back. They fit the plans exactly. EVERY other reproduction that has appeared over time, and the remakes used in Voyager, were *seriously* different from the original." "These plans specify use of an electronic component, the 50240 integrated circuit, which became available in the mid 1970's." Thus, being a TOS item from the 1960s would be out of the question. And as always, pay attention to the provenance, which is absent here. 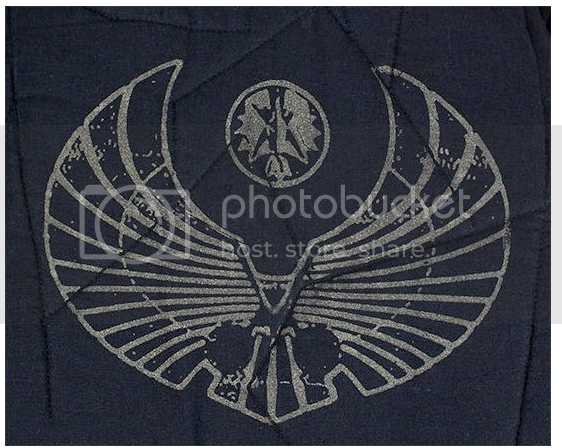 UPDATE: The seller pulled this item after being informed it was not genuine. As as is clear from the above post, I didn't accuse her of trying to defraud anyone, but I was clear that this was mis-described and not what it claimed. It appears she was duped and was passing on what she was told.